One of the best things about historical fiction is the reader’s journey to a time gone by. 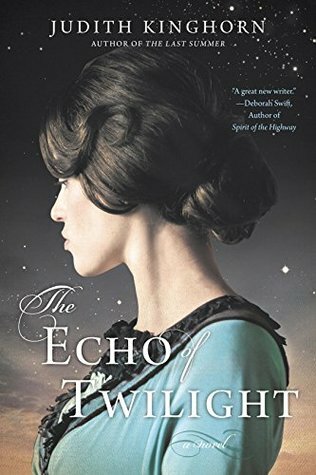 I was immediately immersed in the time period surrounding World War I in this novel by Judith Kinghorn and her writing eased me into a new world. I’ve seen Downton Abbey of course and visited some country houses during travels but even without these personal aides I believe the writing transports you there. We follow Pearl through her early years as she tries to determine a career for herself in a changing world. We are also given her story through scenes from the past and this back and forth is done seamlessly to bring the woman’s persona and past all together. I felt really connected to Pearl and loved her habit of pretending to be someone else- this humour and personal quirk made her come to life. When she’s hired as Ottoline’s personal maid I was even more intrigued by their relationship and Ottoline’s own story. She’s immediately someone you’re drawn to and slightly apprehensive about. I was so glad that not only was Pearl’s story explored to the fullest but that Ottoline’s was given a rounded conclusion also- I would have been so disappointed to not have closure on her also. On occasion the choices of the characters are perhaps completely different from what we would now choose in modern times but The Echo of Twilight manages to bring empathy between not only the women but also those who were their house-keepers, butlers and other staff. There were genuine bonds between them and this made the story so plausible for me as the reader. There are fantastic scenes outside with life like descriptions of the surroundings- you could feel the air move in across the open spaces and the stillness of the moments with Ralph. The Echo of Twilight transported me through the past and gave me characters that will stay with me. Thank you to Berkley Publishing Group of our review copy. All opinions are our own.